This is a simply fantastic example of a Civil War era US M-1850 Staff & Field Officers’ Sword, manufactured by the famous N.P. Ames Manufacturing Company of Chicopee, MA. The US M-1850 Staff & Field Officers’ Sword was officially adopted in the US Army regulations of 1851, but it could trace its genesis back about two years, as correspondence within the Ordnance Bureau shows that a change in sword pattern was being discussed in 1849. The sword was largely based upon the French M-1845 Officers’ sword. The M-1851 regulations established not only a new pattern of Staff & Field Officers’ sword, but also a new pattern of Foot Officers’ sword. In general, Staff & Field Officers’ swords were authorized for officers above the rank of captain, or those of the rank of captain and below, if serving on a General Officers’ staff. 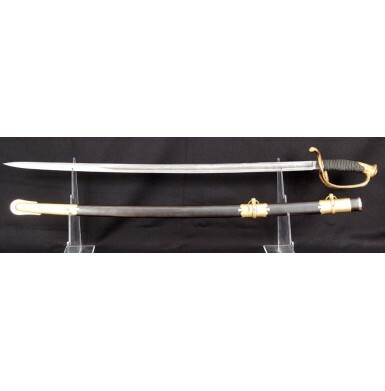 The Foot Officers’ sword was typically authorized for those officers of “company grade”, captains and below, who were not serving in the cavalry. 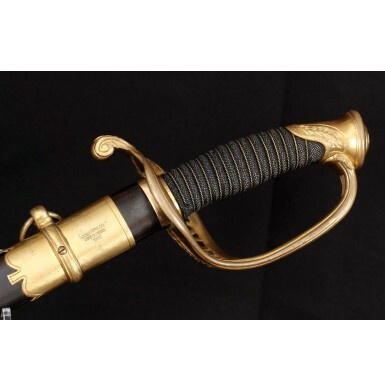 The newly adopted swords eliminated a wide variety of M-1840 pattern swords that were currently in service within the US Army, but were distinct for each of the many branches of the service. Under the new, uniform 1851 regulations, only the Cavalry, Medical Department, Paymasters and General Officers were allowed to keep their own pattern of Staff & Field Officers’ swords. Additionally only company grade Cavalry officers were allowed to keep their own pattern of sword. 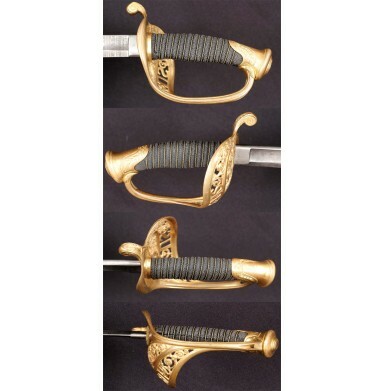 Under the regulations, the Foot Officers’ sword was to be carried in a leather scabbard with gilded brass mounts, while the Staff & Field Officers’ sword was carried in a browned metal (later blued metal) scabbard, also with gilded brass mounts. Company grade officers, who were typically mounted, as in the light artillery, were allowed to carry metal scabbards as well. 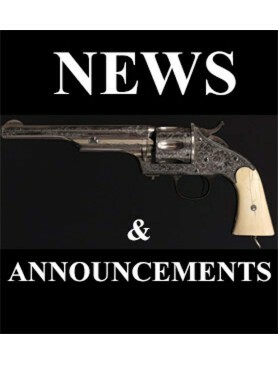 Although the new sword regulations were not official until 1851, the sword that would be known as the M-1850 Staff & Field Officers’ sword was clearly codified and established on paper during that year, and the very first official government contracts were let to Ames for 150 of the new pattern swords on April 10, 1850. Ames delivered 24 in October of 1851, 48 in November of 1851 and the balance of 78 in January of 1852. 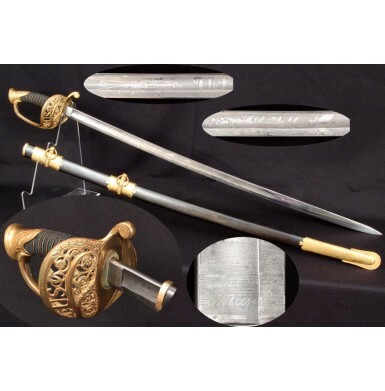 These were all what collectors call “Type I” Ames M-1850 Staff & Field Officers’ swords. They variation from the standard production “Type II” Ames M-1850 Staff & Field Officers’ swords were minimal, with the primary differences being a slightly larger blade that was about ““ longer, ““ wider and 1/16” thicker than subsequent production examples. The Type I swords also had a ricasso covered in gold gilt and a very hilt that was about 3/8” shorter than later production swords. As it was the custom of the US military for the officers to provide themselves with their own uniforms, arms and accouterments, per the current regulation, the US Ordnance Department purchased very few officers swords of any pattern. The vast majority of swords were privately purchased by the officers themselves from military goods retailers like Schuyler, Hartley & Graham of New York City. In fact, only 379 M-1850 Staff & Field Officers’ swords were purchased from Ames by the US Ordnance Department from the adoption of the pattern through the end of the American Civil War. While the US M-1850 Staff & Field Officers’ sword was technically replaced by the M-1860 Staff & Field Officers’ sword, the M-1860 did not officially supersede the M-1850 until about 1870. This allowed both the M-1860 and the M-1850 swords to be used simultaneously for about a decade. 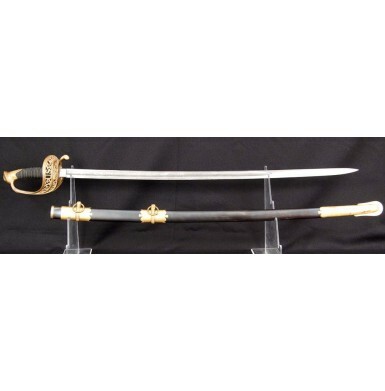 This example of a privately purchased US M-1850 Staff & Field Officers’ Sword is in about EXCELLENT condition. The sword was manufactured by the N.P. Ames Company of Chicopee, MA. The Ames firm could trace their lineage to Nathan P. Ames, who purchased land in Chelmsford, MA toward the end of the 1700s and established a forge to operate as a blacksmith. During the early 1800s the family business grew, repairing and manufacturing a wide variety of metal work. The firm entered the military history books in 1832, when they received their first US government contract to produce swords, the US M-1832 Heavy (Foot) Artillery Sword. For the next century, Ames would remain at the forefront of American Sword production. 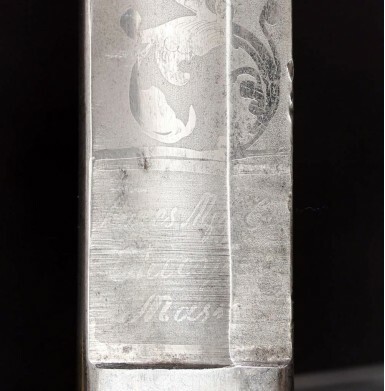 The sword is etched in three script lines on the obverse blade, just forward of the ricasso: Ames Mfg Co / Chicopee / Mass. The etching is still mostly legible and visible, but is a little light and worn due to the sword being inserted and withdrawn from the scabbard over many years. 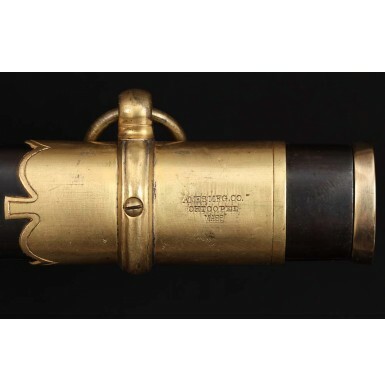 The reverse of the scabbard throat mount is also stamped: AMES MFG. CO. / CHICOPEE / MASS. The blade of the sword is in fantastic condition and retains most of its original bright polish, along with nearly all of its frosted, acid etched embellishments. The obverse shows foliate splays above the ricasso, followed by a panoply of arms, surmounted by the US Eagle, over which the words E. Pluribus Unum are etched in a foliate banner. The reverse is etched with foliate splays, surmounted by a large, script US, over which are displayed another panoply of arms, which are again surmounted by foliate splays. 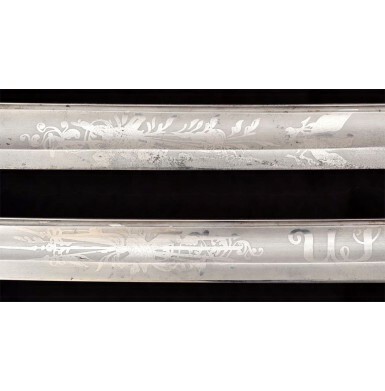 While it is normally very difficult to date the manufacture of an un-dated M-1850 Staff & Field Officers’ sword, the style in which the “US’ is etched on the blade suggests that this sword was manufactured in mid-1862. Prior to 1862, Ames used a block “US’ on their blades, and by 1863 this mark had transitioned to what sword collector, researcher and author John H. Thillmann refers to as a “slanted script US”. 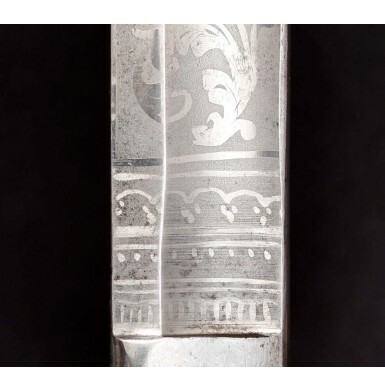 This sword is etched with a US that is in between the two styles. The letters are script, but remain upright and blocky, much like the original block US. They also lack the period to the right of the “S’ that typifies the later blade etching. Although the blade retains the large majority of its original polish and frosting, it does show some very lightly scattered age freckling and minor oxidized discoloration from handling over the years. There are also a couple of very tiny, almost imperceptible dings on the obverse edge of the blade, near the ricasso. These are nearly too small to see, but are mentioned for exactness. 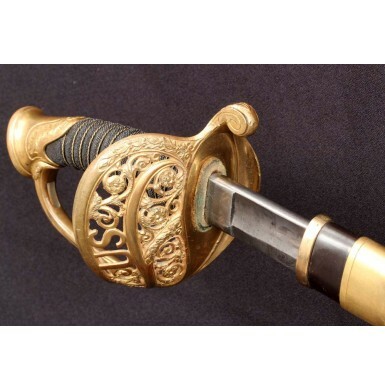 The beautifully cast brass hilt shows the usual Ames attention to detail. The open work filigree is crisp and well executed, and the hilt retains the large majority of its original gold gilt finish. The letters US are crisply cast into the center of the guard between the outer and middle branch, with the balance of the space between the branches filled with foliate filigree. The top branch of the guard and pommel cap show relief cast leaves and the quillon is decorated with leaves on its back and shows lightly engraved highlights on its sides. 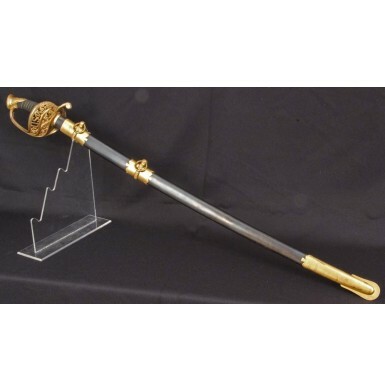 The hilt is solid and secure, with absolutely no wobble or wiggle. 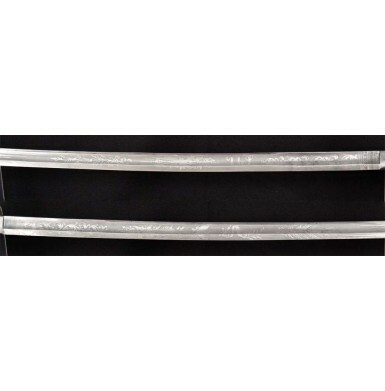 The hilt retains all of its original charcoal colored sharkskin wrap, with original bottom reverse seam. 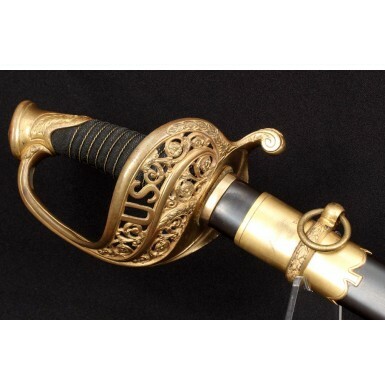 The hilt also retains all 14 original wraps of the double strand, twisted gilt brass wire. The original buff leather throat washer is also in place forward of the hilt, at the rear of the ricasso. The sword retains its original blued steel scabbard, which is in equally fine condition. The scabbard retains about 80% original blue with some thinning and fading, which is mixing with a smooth plum brown patina. The original gold gilt scabbard mounts are all in place and in wonderful condition. The hanger mounts are presentation grade, with relief cast floral figures on the obverse of the hanger bands, which are smooth and round on the reverse. The mounts retain the large majority of their original gold gilt finish, but do show some minor wear and scuffing from carry and use. The mounts also show some minor discoloration and darkening, especially on the drag. This could probably be professionally cleaned and removed if so desired. The scabbard is solid and complete and free of any dents or damage and shows no abuse. Overall this is a really outstanding example of a mid-Civil War production Ames M-1850 Staff & Field Officers’ Sword. The condition of the sword is simply wonderful and the eye appeal of the blade and hilt are fantastic. This would be a very difficult sword to upgrade from and would be a perfect centerpiece to any display of Union swords from the American Civil War period.